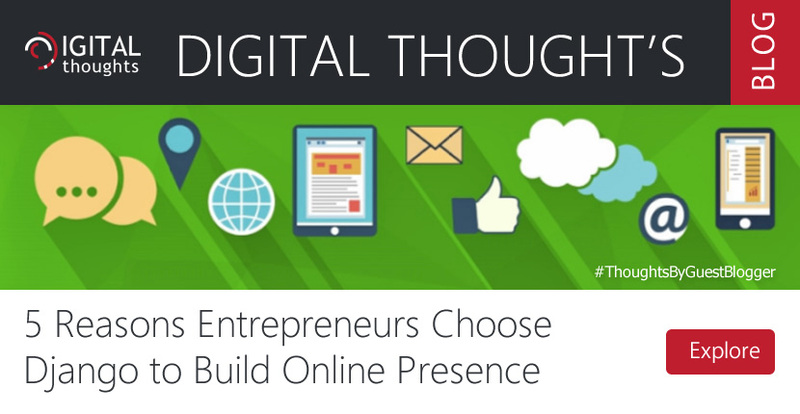 Why Entrepreneurs Prefer Using Django For Building Their Online Presence? Modern entrepreneurs like to establish their brand digitally in the form of an influential website in order to survive in this competitive market. If you wish to build a robust, feature-rich website, it is mandatory for you to choose an appropriate web development framework. Without a doubt, the tech market is overloaded with numerous programming languages and a variety of web development frameworks. However, most of the enterprises choose Django to build their web presence because this framework has the most well-organized documentation and tutorials in comparison to the other frameworks. This framework has gradually evolved as an efficient platform for building small as well as enterprise-grade custom websites tailored to suit specific business needs of different clients. A professional agency offering Django development services is an expert in using this framework for designing extensive large-scale web applications to enhance the bottom line of a business. But what are the other reasons why most of the entrepreneurs choose Django for building their web presence? Let's take a deeper look into it. Django is an open source framework which is available for free to the developers to use it in accordance with their unique requirements. Therefore, there is no need for you to invest in purchasing a license and waiting for it to come before starting to use this framework for development of web apps. You just have to install Django and get started with building your customized website. Also, this framework is continuously evolving in order to simplify the development and deployment of modern customized web apps. Every new version of Django comes with new and innovative features such as Django 2.0 which was launched in August 2018 has a responsive and mobile-friendly admin interface that enables programmers to build more with less code. Also, this admin interface can be customized in several ways and it facilitates smooth accomplishment of different development tasks. The developers get stuck in different areas while using Django as a web development framework. For incorporating the innovative idea into the website logically, the developers need to understand the nuances of this framework. For this, they need a perfectly documented piece, which will give a detailed idea of how the framework actually works. The documentation available with Django is complete and helps developers to overcome the issues they face during the web app development. In addition to the documentation, the support is also incredible. The new versions of Django are compatible with the older ones. Also, there is an extensive community support which helps in terms of upgrades. Installation of a web development framework is a time-consuming and tedious task. But this is not the case with Django. It is very easy to set up and run this framework without any hassles. Also, it offers a variety of options to get started. The most striking feature of Django is that you can get started in less than 15 minutes. Apart from easy installation, Django is highly scalable and websites built on this framework can be customized easily in future to meet the increasing traffic demands. There are approximately 2500+ packages available in Django which developers can use to incorporate the feature or functionality they want in the website. These plugins make accomplishing anything easier for the programmers. These packages already include all the things that developers need for building fully functional websites. There are many famous repositories such as Django Packages and Awesome Django that provide programmers with the extensive list of the most useful and efficient Django packages. Django has been in existence since 2005, and it has been a part of many popular websites and web apps. There is a passionate and enthusiastic community of programmers who perform an extensive research in discovering all the issues in the framework. Also, they make the necessary modifications to fix all such issues. The framework has been tried and tested in every possible environment and it has evolved as a credible and trusted platform for building reliable and feature-rich websites. In addition to the ones mentioned above, there are many more benefits to make you choose Django for developing your next website. This framework can be used to build extensive web applications quickly without compromising on their quality.